Blog entry by Stacy Bowe. 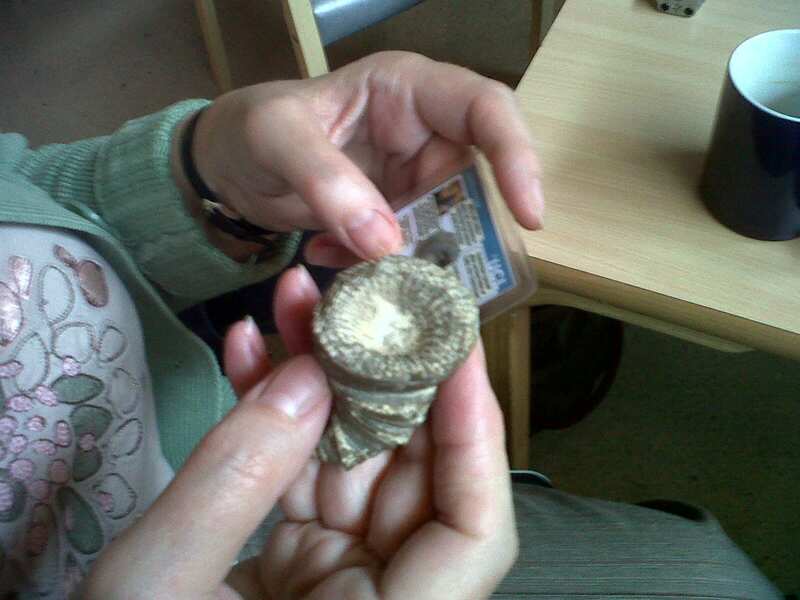 Stacy is studying for her MA in Managing Archaeological Sites and has been volunteering on the project since May 2013. Here she tells us more about the Community Curation project. 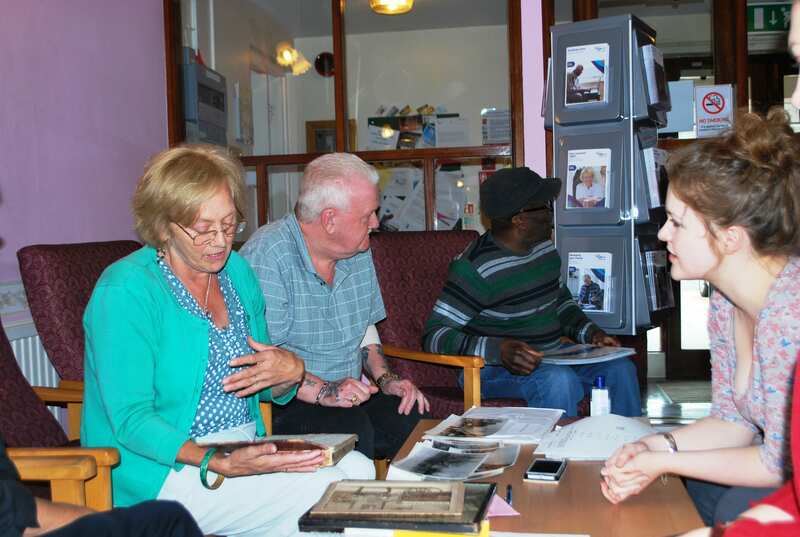 After I had been conducting Touching Heritage sessions for a couple of weeks, I accompanied two of my other facilitators to a sheltered housing centre for a new type of session, where participants were invited to bring out an object or two of their own to share. Sitting on the table was a worn leather journal that immediately attracted my attention. The cheerful owner explained that this tome was actually the diary of her great grandfather, written when he was a sailor in the British navy, stationed in the Pacific during the later years of the nineteenth century. She carefully handed it to me, and as she continued discussing the diary’s attributes, I quietly examined some of the entries. In striking penmanship, the eagerness of the diary’s author was palpable. All events from the profound to the prosaic were recorded. His descriptions and judgements exuded a youthful and sometimes juvenile sparkle to the diary’s contents, and it suddenly struck me that the author was only eighteen at the time of this incredibly daunting experience. The entries mingled with a bit of horror, amusement, and excitement. Whether he understood or not, the author was discovering first-hand the reasons why Europe was becoming obsessed with all things Asian. Picturing myself back at eighteen, I smiled to think at what I would have potentially written in the same situation. I empathized with his wonder and bewilderment. Her grandfather may have been long gone from this world, but as I handed the diary back to the participant, I knew we had shared an intimate moment together across history. Blog entry by Maraiachiara Leto – Touching Heritage Volunteer. Mariachiara has been volunteering on the Touching Heritage project since May 2013. Originally from Italy, she is about to embark on her Masters degree at UCL in Comparative Literature. She is interested in the cultural meanings of objects and how objects can help us connect to forgotten memories and meanings. When I first signed up to volunteer as an Object Handling Facilitator, the idea I had about the project was very different from the real thing. I thought we had to work as guides, giving people living in healthcare centres some information about museum objects. During training I soon found out that I was completely wrong: the objects were a chance to start an informal conversation, rather than educational tools. We were made aware of how important is for the participants to touch the objects and to connect their shape with their own memories. Before I had time to wonder how this kind of activity could be beneficial or even interesting for participants, I found in my hands a marble thumb belonging to a statue of Alexander the Great. As I was supposed to keep my eyes closed and to guess what I was handling, at first I thought it was merely an everyday object used for the training session. Then, as soon as I realised that it belonged to such a remote past, I got a strange feeling, halfway between surprise and delight. Previously, I had always seen museum objects behind glass: this made me think how rare this opportunity was. Moreover, the conversation I had with my fellow volunteer was really amusing: since she was very hungry, every object reminded her of something to eat! Later on, when I started the actual project, I found it amazing how inspiring and evocative these objects proved to be. Most of the participants have actively taken part in the session, showing interest, asking questions and setting their imagination free. For instance, the kind older man I talked to on my first day started the conversation on the topic of starfishes, as he was handling a star fossil, but ended up talking about the Molotov-Ribbentrop pact! I missed some of the logic in his speech, but it was a very pleasant and lively conversation: at the end, just before going out for a cigarette – since, as he said, “smoked meat lasts longer” – he told me he enjoyed talking with me about history. This was not the only occasion when a participant wanted to share their passion. When handling a shark tooth fossil, one lady declared to be fond of documentaries on dangerous animals (apparently, the most dangerous one in the world is a spider). Another lady sitting with us, claimed she was not at all afraid of sharks. I asked whether this was true and how she would feel if she happened to meet a shark during a swim. She answered: “Well, that’s a different matter…” We thus kept talking about sea animals, wondering why we tend to find them more intriguing than land animals: is it because they are concealed from us and we still wonder at discovering there is a whole colourful world under water? Conversations like these show that museum objects can really work as sources of pleasant distraction for many people. I was glad to notice that participants generally tend to share nice memories rather than unpleasant ones, as an older lady did when, touching a small Egyptian pot, remembered the little polished marble heart her father gave her as a present when she was a young girl. This kind of mental associations, which I believe to be the true benefit of the project, would not be possible if participants were enforced to listen passively to a large amount of information. Unexpectedly, I am now involved in a cultural activity that I find unconventional and, for this very reason, incredibly interesting.